I had a wonderful day off at the Holiday park in Taumaruiti. It took me a while to figure this out, but “Holiday Park” means “RV Park,” but with a friendlier feel to it. When I first saw this name, I thought about the movie Tommy, if any of you remember it. 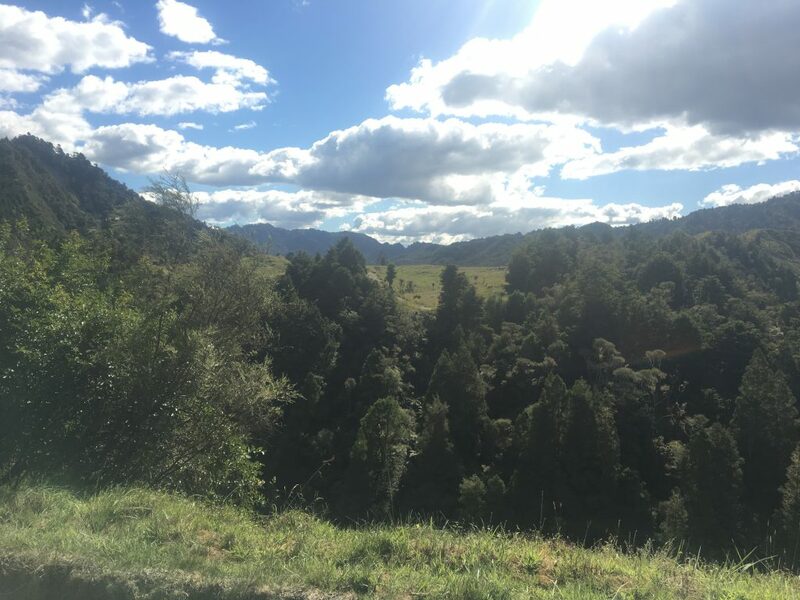 The park in Taumaruiti is a natural stopping point for people walking across New Zealand. I met several of these people, really nice people all around. 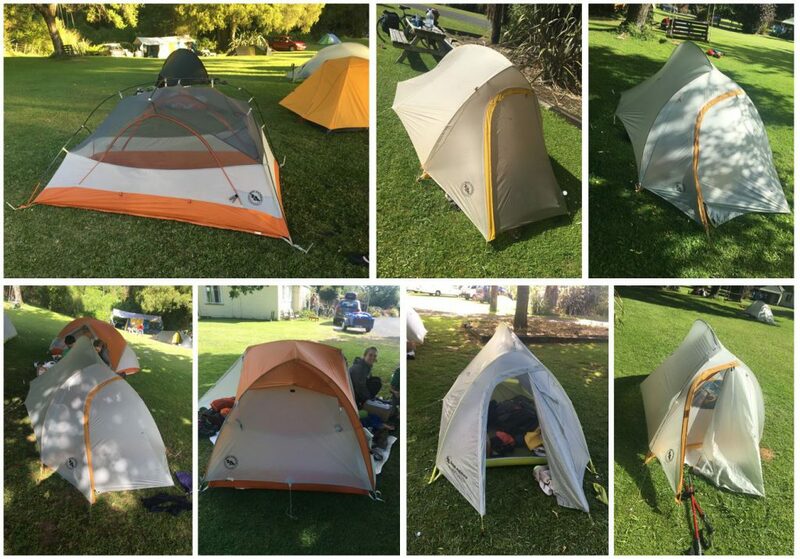 One thing they have in common is that they all use Big Agnes tents! I took a picture of them all and sent it off to Big Agnes; I have not heard back from them yet. 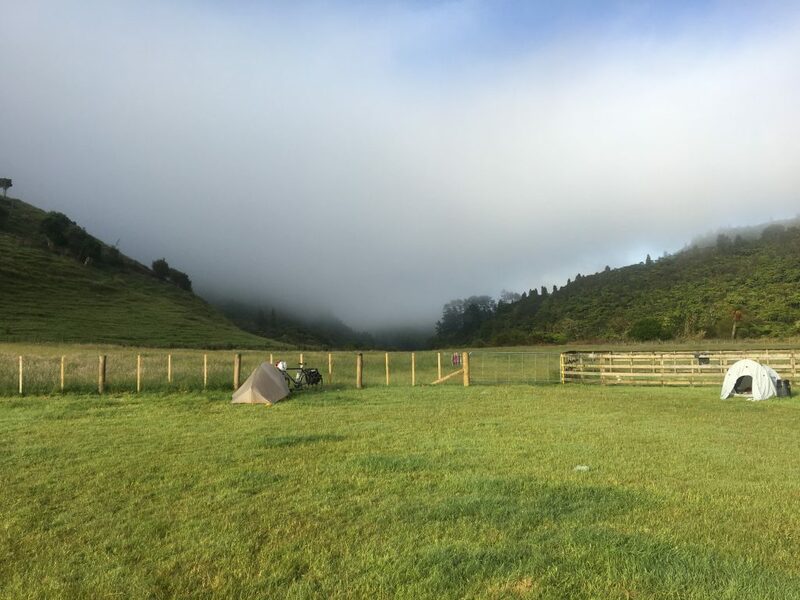 Big Agnes is the standard even in New Zealand. Some of these people really know how to backpack. 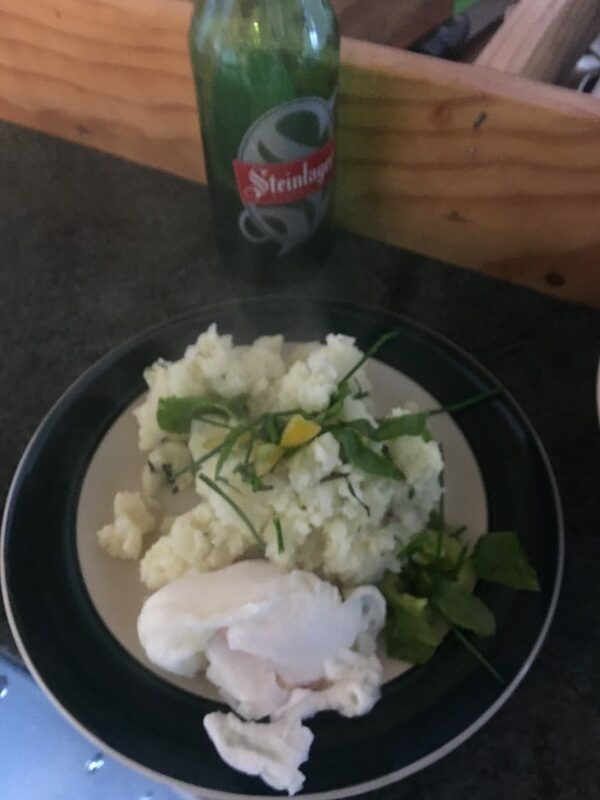 I met a young man who offered to cook me a gourmet breakfast–mashed potatoes with fresh basil and tarragon, garnished with garlic butter and a poached egg. You find your pleasures where you can on a 1000 mile hike. Gourmet backpack breakfast. The beer bottle was used to smash the potatoes. OK–now for the tour. I got on the road a little late the morning of 12/30, with the destination of the Blue Duck Lodge in Whakahoro. Counting the ride back into town, this would be a 77 km jaunt, with some pretty serious climbing involved. I can do 77 km, even with hills, in a long day. And, since it doesn’t get dark until 9:30, it should have been a piece of cake. What I didn’t plan on was the gravel. 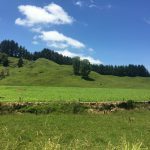 I have been using a New Zealand website as a resource in planning this ride. 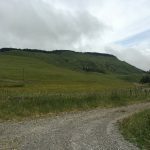 The section from Taumaruiti to the Blue Duck Lodge mentions that you need to follow a gravel road for quite a while. 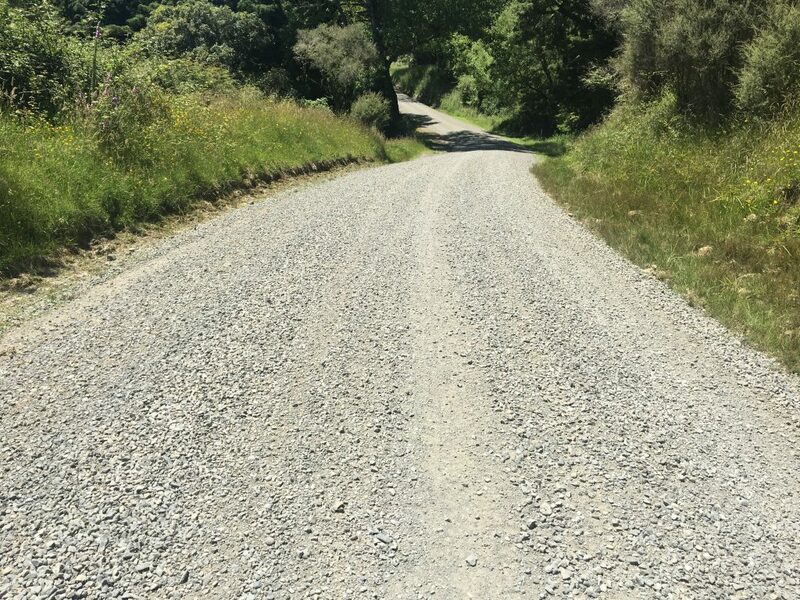 Since, all throughout the website, the author uses the word “gravel” whenever referring to an unpaved road, I immediately interpreted it as meaning a “dirt” road. I have no problem with dirt roads. 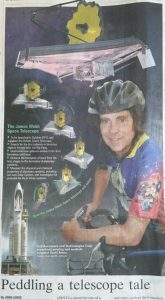 I peddled over 600 miles in Europe on dirt roads. Gravel is an entirely different thing. About the only worse thing you can ride on is sand. On up-hill sections, you have to sit back on the bike or your rear wheel will spin. On down hill sections, you can hardly brake without sliding. And, on a camber, you will slip **sideways** to the bottom of the slope. I only wiped out once, which is amazing. My hip, left knee and chest are really sore, but I will heal. I grossly underestimated the difficulty of the ride and paid for it. But what unbelievable beauty! When I arrived at the Blue Duck campground, I met an interesting man–Vincent–who took quite an interest in my bike. He had an almost emotional response to my “Klein” and introduced himself to me by saying, “Oh…..I competed in my first Ironman on a Klein.” When a man who is a couple years your senior says something like that, you pay attention. He talked about the pride that Gary Klein took in his product work and the quality that resulted. I feel the same way, which is why I am riding this bike and not another. I had a chance to interview people at the campground who were coming the other direction. I would have a tough 26 km, followed by a class 3 mountain bike trail for 10 km. And then, about 80 km of “gravel.” I suppose that I could have just pushed through it. You can eat a steak with a butter knife, after all. But why would you when you have a choice? 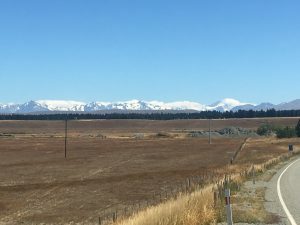 I opted to hitch a ride with Ron and Peggy Frew to Ohakune which is where I would have ended up if I opted to take SH4, instead of the scenic route. Rod and Peggy own several farms in the region and is a major producer of lambs, wool, potatoes and carrots. On the whole, my aborted foray into the wild is a wash. I had a wonderful ride, through indescribable beauty. I met some really neat people. But, this time, I am using some common sense and falling back to regroup. It’s the right thing to do, especially since it seems that I am coming down with the stage’s head cold (rats). It supposed to rain the next couple of days, so I may just hunker down here for a while until I feel better. It is sealed and for the most part well away from SH1 which is full of traffic at this time of year. The relatively brief section on SH1 also has good shoulders. bypass Hunterville and turn right onto Aldworth Road (sealed) before Hunterville. At the end of Aldworth Road is SH1. Turn right and follow until Kakariki Road (signpost shows Feilding). 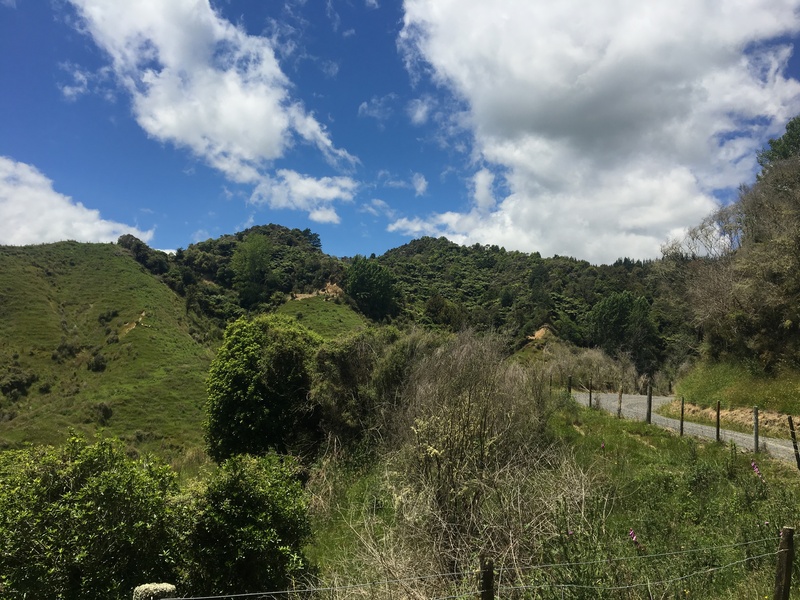 Kakariki Road turns in to Halcombe Road. Follow until Feilding then on to Palmerston North. Have a happy New Year, filled with grander things. Another cold? Well, it wouldn’t be the JWST World Bicycle Tour without one😉 You are seeing such beauty, Scott. Enjoy it all! Love you!